Ya Jagoff!!! | Windows? WINDOWS! Wiiiiiiindows!! 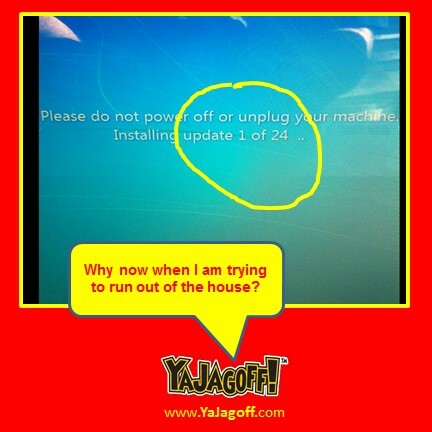 Home Computer Jagoffs Windows? WINDOWS! Wiiiiiiindows!! OK, time to run and drive like a Jagoff to get to the next meeting. Time to shut down the laptop. Then I see the screen above. THAT’S EXACTLY WHAT I NEEDED RIGHT NOW!!!! And then it takes 17 minutes to complete. OK, Bill Gates Kool-Aid drinkers, the next time I need an update to my “Macro-.dll-DMAK-GDI-Net BEUI-.mxp-WFW 3.11-WEW-.PSD-.xml-WYSISYG-VXB-.vga-URL-.SDK-LMNOP-EIEIO-WTF syntax” files, how about a little warning and a choice to say “Not right now I have a million @#$@# things to do” YA JAGOFF!! !